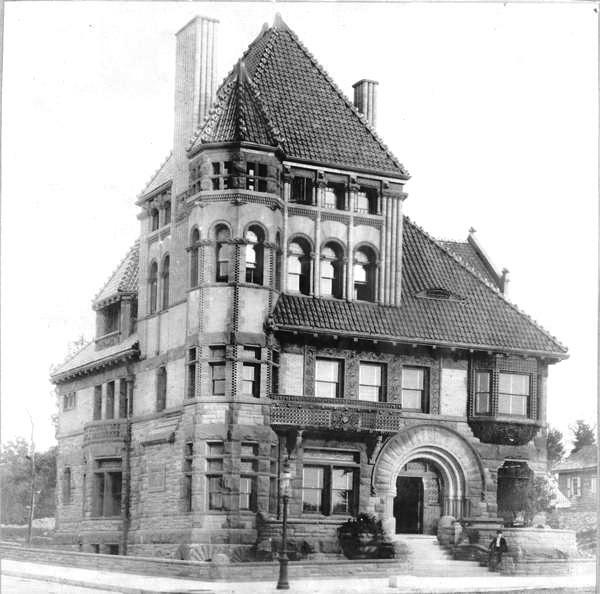 In 1889 banker Samuel Gamble Bayne lived in an imposing brick and stone Romanesque Revival mansion in the wilderness of Riverside Drive and 108th Street. A true urban pioneer, Bayne foresaw the future of the still-undeveloped area, with its breathtaking Hudson River views. 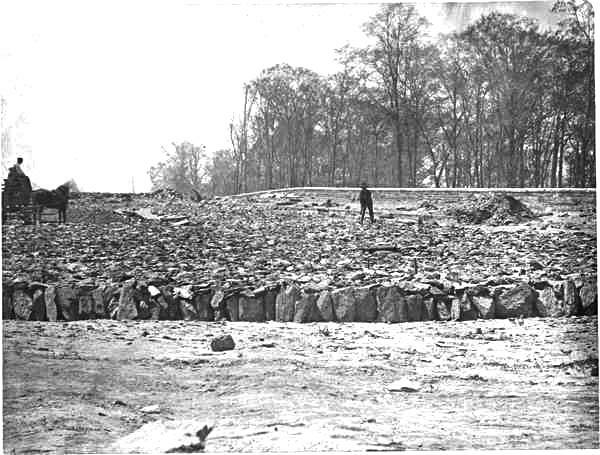 Riverside Park, designed by Frederick Olmsted, was inching northward from 72nd Street. 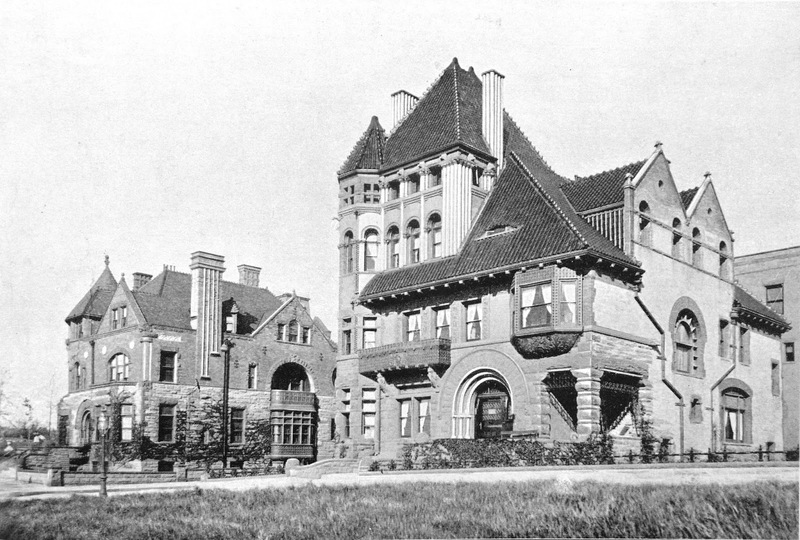 The Irish-born millionaire knew that before long this stretch of Riverside Drive would lined with mansions like his. The completed house at No. 355 Riverside Drive both complimented and outdid the former home. A masterpiece of Romanesque architecture, it was a blend of brick and stone with a complex red-tiled roof. Freeman alleviated the often-sluggish feeling of the heavy style with a soaring four-story corner pavilion; rows of closely-grouped openings and a sweeping southern roofline. Balconies and bays provided dimension along with the several dormers. The squared angles of the corner porch were interestingly juxtaposed with the massive, abutting entrance arch. Bayne had immigrated to Pennsylvania from Ireland in 1870. Having been a linen manufacturer in Belfast, he made the unexpected change to the oil business. He bought up land leases and drilled for petroleum. With the funds from that enterprise, he bought up small banks throughout Pennsylvania. 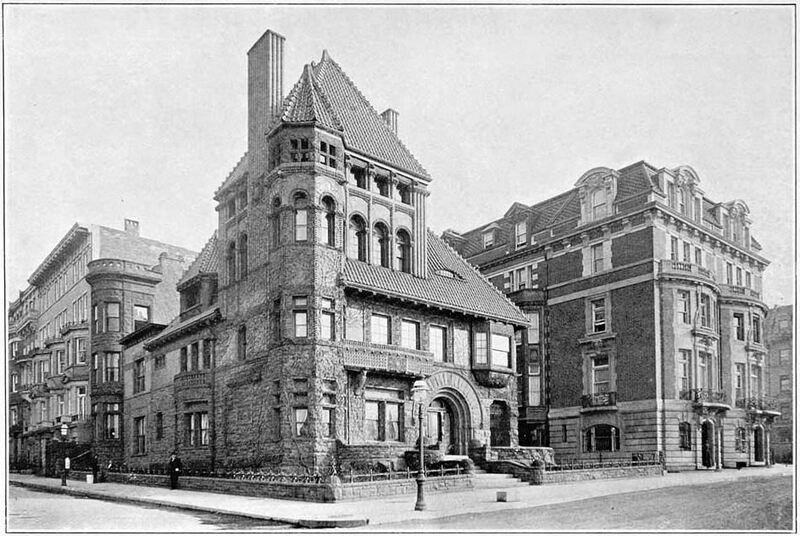 By the time he and his family moved into the new Riverside Drive mansion in 1891 the 41-year old was fabulously wealthy. 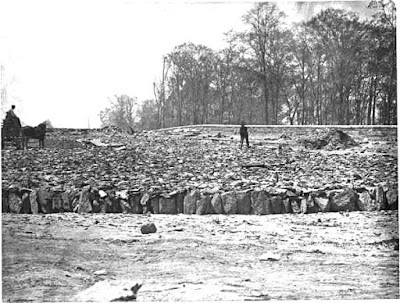 Although The New York Times claimed that the sprawling block around the corner home was intended as “his garden;” it is more likely that Bayne bought up the lots simply to ensure the quality of his neighbors. As he sold off the plots, their deeds included strict covenants that only “high class residences” could be built. Samuel and Emily Bayne had two children, Emily and Howard. The family summered at their country estate, Glenalla, in White Plains, New York. Three months later on January 15, 1910, Emily’s brother married into the socially prominent Van Beuren family. 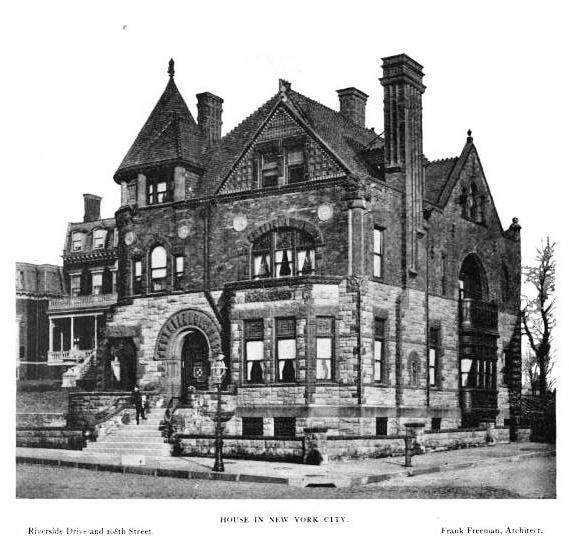 Howard and Louise Davis Van Beuren were married in the old Van Beuren mansion on West 14th Street. And then, on April 26, Louise was Emily’s maid of honor in her fashionable St. Bartholomew’s Church wedding. The gala reception was held in the Bayne mansion. In 1911, only months after seeing her children married, Samuel G. Bayne’s wife, Emily, died in the Riverside Drive house. The aging widower, now alone, remained in the mansion. Age could not slow the resolute banker. In 1920, at the age of 74, he decided he was getting “entirely too fat.” According to the New York Herald, “He stopped eating meat and wheat and took to corn meal, sea food and a light diet. The same habits of self-denial which he had formed in his youth held up his resolution when as a millionaire he could have anything to eat which his heart and his taste desired.” Within 15 months he had lost 37 pounds. The buyer, Harris H. Uris, president of the Harris H. Uris Iron Works, announced his intentions of building at 14-story apartment house on the site. “S. G. Bayne intends to go back and occupy the entire top floor as his own residence, having spent forty years on the site, which he declares has the finest views of any in New York,” reported The Times. It was no doubt no coincidence that the architect of the new building was Bayne’s son-in-law, Alfred C. Bossom. 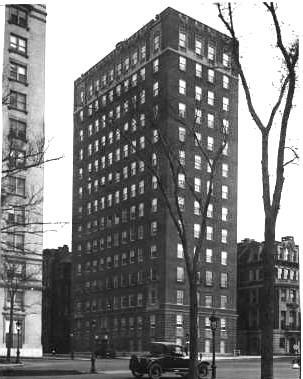 Bossom’s apartment building still survives where the long-forgotten Romanesque masterwork had stood. As an interesting side note, the architect’s life would greatly change after the Riverside Drive commission. He became one of the foremost Texas architects, designing important structures like the Magnolia-Mobil Petroleum Building in Dallas and Houston’s Petroleum Building. But in 1926 he and Emily moved to England during the apex of his career, determined that their three sons receive a British education. Bossom gave up architecture, and was elected to Parliament in 1931. A year later, during a violent thunderstorm, Emily was the passenger in a small airplane piloted by their son, Bruce Bayne Bossom. The plane broke up in flight, killing them both. Alfred C. Bossom was made a baronet in 1953 and in 1960 made a life peer. He took as his title Lord Bossom of Maidstone. He died in London in 1965 at the age of 83. What a beautiful pairs of houses in a style not much admired nor desired these days. Along with Tudor, Richardson Romanesque seems to elicit undeserved criticism and fears of very dark, oppressive and sad interiors, probably from being represented in too many horror pictures. I think the homes were absolutely beautiful, and I'd love to live in something similar. Both are certainly better than much of what is built today, and I wonder if craftsmen could be found to build anything remotely similar.